As a Dentist, I am getting a common statement that “everyday i am brushing, but why tooth stain are coming on my tooth, please prescribe a good toothpaste & how to remove this stain, its looking ugly”. In this article i will discuss in details on this topic causes, prevention & treatments. This is a stain on the external surface of the tooth. External are common and have many different causes Some extrinsic discolorations that are allowed to remain for a long time may become intrinsic. Dental Plaque & Calculus: Your mouth is full of bacteria that combine with saliva to form a sticky film known as plaque, which builds up on your teeth. This plaque later becomes hard on the tooth,its call Calculus. Tobacco & Betel: It causes yellow-brown-black stain around tooth. This is a stain on the inner portion of the tooth. Some intrinsic stains comes at the time of tooth development sometimes it comes later. Fluorosis: So much intake of fluoride can lead to dental fluorosis, a condition that causes white spots or lines on the teeth. Dental fluorosis only affects children whose permanent teeth are still forming beneath the gum line. 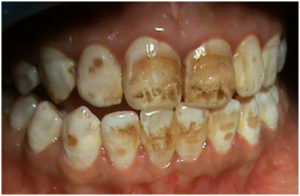 A common cause of fluorosis is excess fluoride level of drinking water in some areas. Age-Related Teeth Stains: With the age tooth gets discolored. Brush gently twice-daily in proper technique with a soft/medium bristle or electric brush. don’t use hard brush. Use tooth paste. Don’t use Charcoal to clean tooth. Rinse water after every food. Use Dental Floss. Gargle with warm salted water regularly. Sometime use Chlorhexidine mouthwash. Don’t take fluoride containing water. Pregnant mother shouldn’t take Tetracycline drug. If you are having malocclusion then get the treatment. For normal extrinsic tooth stain first Scaling is recommended, then if want more white tooth then bleaching is indicated. But tooth bleaching is not always indicated. To remove intrinsic stain commonly tooth Metal Ceramic or Full ceramic Veneering or Crown is indicated.